A seagrass species from the Red Sea is outcompeting the native seagrass species in the Caribbean, where the green sea turtle lives. These iconic turtles are seeing their grazing areas decline, because they have little interest in the foreign seagrass. Wageningen researchers and colleagues from other research institutions discovered how these large underwater grazers seem to dig their watery grave with their own eating behaviour. The Journal of Ecology for this week reports on the topic. The green sea turtle Chelonia mydas swims in these same tropical waters.For millions of years, it has been gracefully grazing in the fields of the native seagrass species. This large grazer primarily forages in the deeper areas of the seagrass meadows. However, this began to change in 2002. That was the year that this exotic seagrass invader made its entrance from the Red Sea. 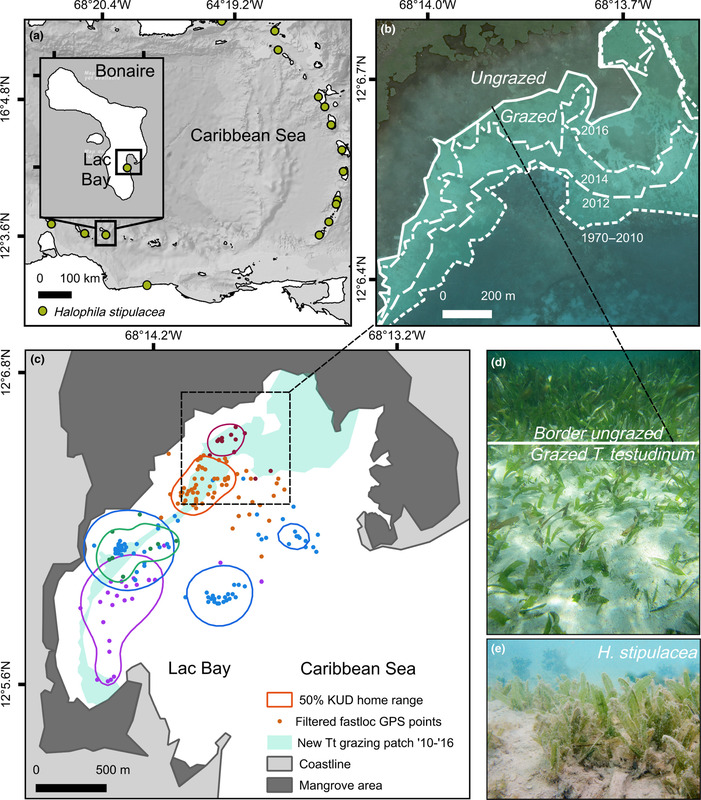 This foreign seagrass spread quickly across the eastern Caribbean and formed thick meadows in the foraging areas of green sea turtles. In 2010, the new species found its way to Lac Bay on the island of Bonaire, in the Dutch Caribbean, where a research team led by Marjolijn Christianen, with Lisa Becking and Fee Smulders of Wageningen University & Research and Per Palsbøll from the University of Groningen designed a study funded by the Netherlands Organisation for Scientific Research (NWO) and the Dutch Ministry of Economic Affairs. 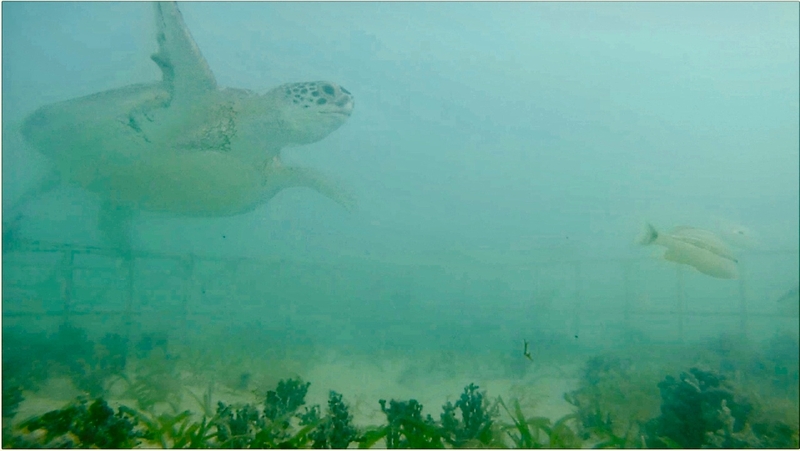 Their goal was to investigate the role of sea turtles in the distribution of this exotic seagrass species. The team, further strengthened by colleagues of the University of Amsterdam (Arie Vonk), Sea Turtle Conservation Bonaire (Mabel Nava, Sue Willis), STINAPA Bonaire (Sabine Engel) and Wageningen Marine Research (Dolfi Debrot), wants to research how these large grazers influence the expansion of exotic plant species in aquatic systems. However, what was even more problematic for the researchers is that they observed the exotic seagrass spreading more quickly in grazed areas in comparison to ungrazed areas. Ultimately, in the six years between 2011 and 2017, H. stipulaceaunderwent an expansion of six to twenty per cent of the permanent monitoring locations. During the same period, coverage with the native seagrass Thalassia testudinumdropped by 33 per cent. According to the researchers, it would beneficial for sea regions if they were less polluted by sewage or dredging activity, as this decreases the vitality of the old seagrass fields. “We are seeing that sea turtles are facilitating the expansion of the invasive seagrass through their grazing behaviour. If you want to protect these charismatic grazers, stress factors have to be reduced throughout the ecosystem. Therefore, water purification and removing factors that generate murky water in seagrass fields will help. For the dry Caribbean islands, this would partially be addressed by counteracting overgrazing by goats on the islands, as they eat everything until the ground is bare which encourages erosion. 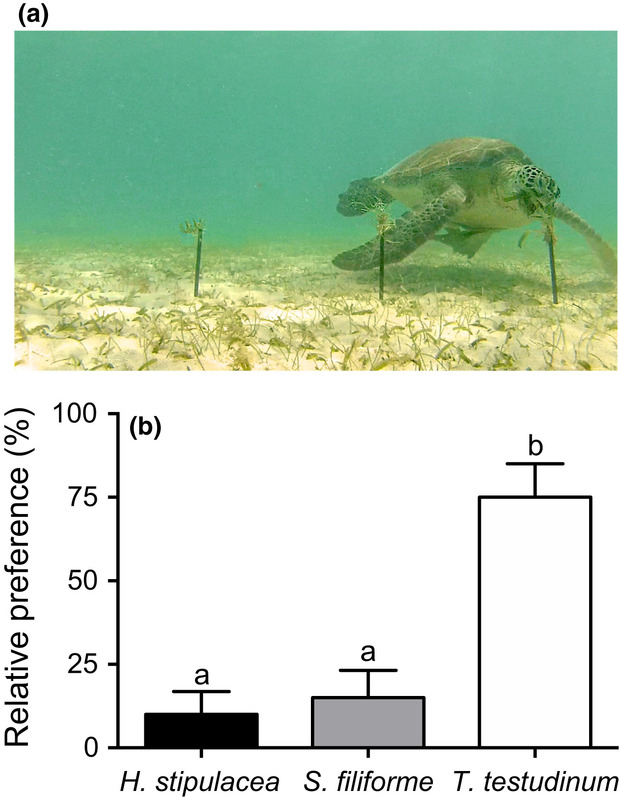 Megaherbivores may impact expansion of invasive seagrass in the Caribbean Marjolijn J.A. Christianen, Fee O.H. Smulders, M. Sabine Engel, Mabel I. Nava, Sue Willis, Per J. Palsbøll, Adolphe O. Debrot, J. Arie Vonk, Leontine E. Becking. Journal of Ecology, 17 July 2018. https://doi.org/10.1111/1365-2745.13021. 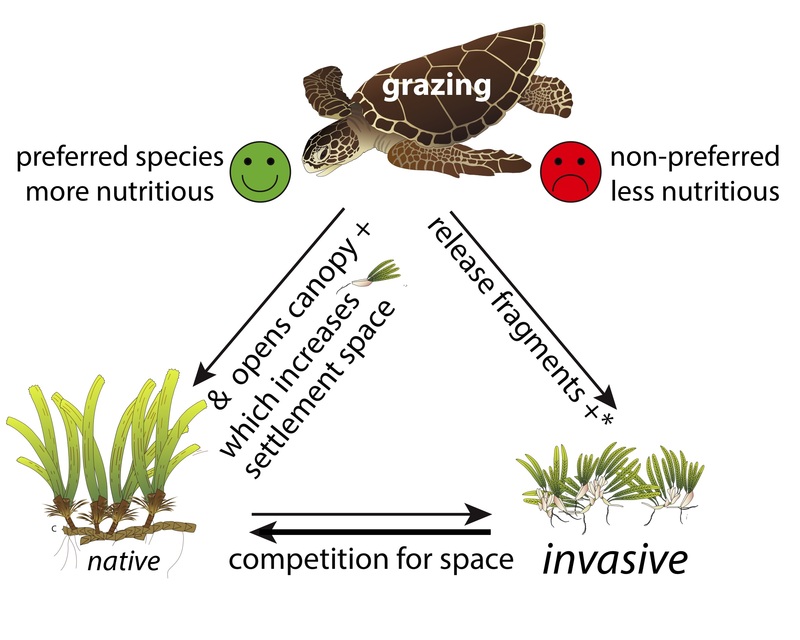 (pdf) The research project was funded by the NWO project Ecology and Conservation of Dutch Caribbean Sea Turtles, by the NWO-VENI grant Global defaunation and plant invasion: cascading effects on seagrass ecosystem services. Fieldwork was further supported by IUCN NL/ WATW project ‘Conch Restoration in Lac Bay Bonaire’, STINAPA project ‘Project Plan Ecologisch Herstel Lac en zuidelijk kustgebied’, donations to Sea Turtle Conservation Bonaire (STCB) of World Wildlife Fund Netherlands, Dutch Ministry of Economic Affairs, Dierenlot Foundation, Volkert van der Willigen of the Amsterdam University Fund 2015, the BO‐project of the Dutch Ministry of Economic Affairs. For more information, please contact Marjolijn Christianen, Wageningen University & Research, marjolijn.christianen @wur.nl; or Jac Niessen, Science Information Officer at Wageningen University & Research, jac.niessen@wur.nl.